This reconstruction project aims to make high school students think and act by their own initiative. 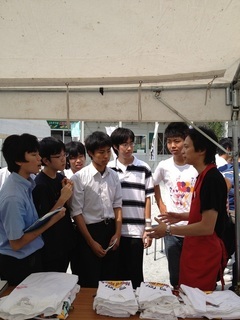 The students visited farmer’s and fish market managed by “Soma Haragama Asaichi Club” and kid’s playground managed by BBF. The students helped at the market and the playground while interviewing the visitors, and considering fishing industry reconstruction and child-raising in Soma. 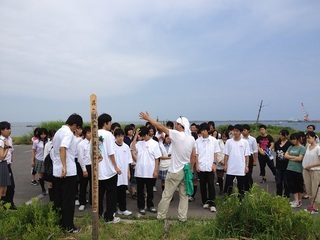 Mr. Takahashi, chairperson of “Soma Haragama Asaichi Club” took students to Ohama beach and Soma fishing port, severely damaged area. They all became speechless looking at the condition of the area. 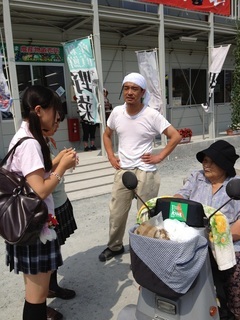 BFF volunteer took them to Odaka district to show the condition, totally dried up after all seawater ejected. 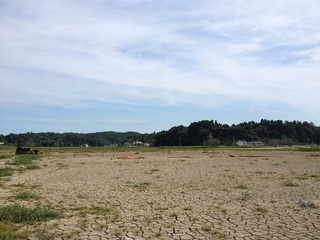 They were surprised to compare its recent condition and the photo on April 2012 when the area was yet covered by full of seawater. Fukushima High school, aiming at developing future generation’s leaders, will take more actions for its aim by this fieldwork experience.